Vigorous perennial with clumps of sharply-toothed, mid-green leaves. From June to September carries sprays of large lavender-blue star-like flowers with white centres. Tolerant of dense shade. Dies down in winter but will shoot again in spring. Height 6ins (15cm). Plant 12-15ins (30-38cm) apart. BUGLE, BURGUNDY GLOW (Variegated Bugle) (Ajuga reptans Burgundy Glow). 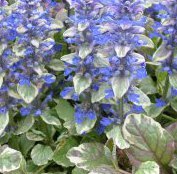 A useful evergreen ground cover plant with crinkled shiny green foliage variegated pink, bronze and cream, forming a dense mat which in spring is spiked with erect whorls of blue flowers. Spreads rapidly but is not invasive and is particularly effective under deciduous shrubs. Height 2ins (5cm). Plant 12ins (30cm) apart. CATMINT (Nepeta faassenii, N. mussinii). Bushy plant bearing silvery grey-green, wrinkled, hairy aromatic foliage, attractive to cats. Freely produces 6 inch (15cm) spikes of pale lavender-blue flowers from May to September. Cut down to ground level in spring. Well drained soil. Height 12ins (30cm). Plant 12ins (30cm) apart. Clump forming perennial which retains lower dark green leathery leaves all winter. From winter to early spring stout purple marked stems appear bearing large 1.5 to 3inch (4 to 5cm) wide shallow saucer-shaped white, or sometimes pink flushed flowers with greenish centres. Prefers heavy, neutral to acid soil, moist position and dappled shade. Height (in flower) 1ft (30cm), spread 18ins (45cm). COTONEASTER CORAL BEAUTY (C. suecicus Coral Beauty). Evergreen shrub with small white flowers in June followed by orange-red berries in autumn. Vigorous, ideal for covering banks or ground beneath other shrubs or trees. Tolerant of moderate shade. Height 18ins (45cm), spread 5ft (150cm). Plant 2ft (60cm) apart for fast coverage. Ground hugging evergreen with glossy green leaves and masses of small white flowers in June followed by large scarlet-red berries in autumn. Vigorous and ideal for ground cover beneath trees or taller shrubs. Tolerant of moderate or dense shade. Height 2-3ins (5-8cm), spread 5-7ft (1.5-2.1m). Plant 2ft (60cm) apart. COTONEASTER HORIZONTALIS ROBUSTA (Cotoneaster hjelmqvistii). Fast growing semi-evergreen variety with stems forming a herring-bone pattern. Glossy dark green leaves turn bright red in autumn. Masses of pinkish-white flowers, very attractive to bees, are followed by a profusion of bright red berries in autumn. Useful for ground cover or training on a wall of any aspect where a height of up to 8ft (2.4m) can be reached. Height (ground cover) 18-24ins (45-60cm). Plant 2.5ft (75cm) apart. 30-40cm £2.49 £1.99 £1.84 £1.60 OUT OF STOCK. Attractive whorls of mid-green leaves are starred in summer by bracts about half an inch (2.5cm) across and pure white surrounding tiny purple-green flowers. They are followed in autumn by clusters of bright red globose berries. Good ground cover plant with creeping but not invasive roots. Thrives in shade, preferably in acidic soil. Dies down in winter but shoots again in spring. Height 4-6ins (10-15cm). Plant 18ins (45cm) apart. CREEPING JENNY, GOLDEN (Lysimachia nummularia Aurea). Vigorous, creeping, rooting stems are covered by pairs of soft, round yellow leaves. Bright yellow cup-shaped flowers in summer give the plant the appearance of a golden carpet. Moist soil preferred but tolerant of any ordinary soil. Evergreen in sheltered positions. Height 1-2ins (3-5cm). Plant 9-18ins (23-45cm) apart. Clump forming perennial with mid-green lance shaped leaves which die down in winter. In mid to late summer it produces long lasting, funnel shaped, brightly coloured flowers on elegant spikes which are excellent for cutting. Rich, dark red buds on deep purple stems opening to beautiful orange-red lily-shaped flowers. Height 2ft (60cm). Plant in humus rich soil in sun or semi-shade. Clump forming perennial with mid-green lance shaped leaves which die down in winter. In mid to late summer it produces long lasting, funnel shaped, brightly coloured flowers on elegant spikes which are excellent for cutting. Very striking bright red flowers 2ins (5cm) long on bold, slightly arching spikes. Height 3-4ft. (90-120cm). Plant in humus rich soil in sun or semi-shade. DAY LILY, GENTLE SHEPHERD (Hemerocallis). Very easy to grow perennial with arching grassy leaves which thrive in full sun or partial shade and make excellent ground cover. The individual flowers only last a day but they are produced over a long period in mid-summer. Plant in full sun or partial shade and divide every 2 to 3 years to enhance the flowering capacity. Semi-evergreen with lightly scented circular flowers 5 inches (13cm) across, creamy-white with neatly puckered petals. Strong grower producing many flowers. Height in flower 3ft (90cm) plant 4ft (120cm) apart. DAY LILY, STELLA DE ORO (Hemerocallis). Evergreen, free flowering, vigorous variety with fragrant 2 inch (5cm) wide trumpet-shaped flowers, bright golden-yellow with a small green throat. Forms a neat clump. Height in flower 1ft (30cm), plant 18ins (45cm) apart. DAY LILY, SUMMER WINE (Hemerocallis). A strong growing variety which, throughout June and July, produces masses of 5.5 inch wide, wine red, heavily ruffled flowers with a yellow throat. Height in flower 2ft (60cm), plant 18-24ins (45-60cm) apart. ELEPHANT'S EARS (Bergenia cordifolia Purpurea). Evergreen clump-forming plant with leathery, purple tinged green leaves. Clusters of spectacular bell-shaped deep pink flowers on red stems held well above the foliage in late winter and early spring. They will tolerate dry windy conditions. Height 12ins (30cm). Plant 12-15ins (30-38cm) apart. Good ground cover plant for either shade or sun, particularly attractive in spring when the heart-shaped leaves are tinged red and in autumn when they turn yellow and orange. Sprays of crimson flowers are held above the foliage in spring. Height 12ins (30cm). Plant 12ins (30cm) apart. Dense ground cover if trimmed. See Hedging section for details. EUPHORBIA ROBBIAE (E. amygdaloides R.) (E. Mrs. Robb's Bonnet). Very fast spreading, low growing, evergreen perennial with closely set leaves on reddish-green stems. From mid-spring to early summer it is covered with dome-shaped greenish-yellow flower heads 7ins (18cm) high. Excellent ground cover plant. Height 24ins (60cm). Euphorbias are easy to grow, and do best when planted in a sheltered spot away from strong winds. They do prefer rich, moist, organically improved soil - so work in generous amounts of home-made compost or Tree, Shrub & Rose Planting Compost or some well-rotted manure around the soil with a good generous application of Bonemeal, and when planting, don't forget to use some RootGrow. Plant 18ins (45cm) apart. EVERLASTING SWEET PEA, PINK PEARL (Lathyrus latifolius Rosa Perle). Colourful, reliable, fast-growing, easy perennial, producing masses of large, pearly-pink flowers over a long period. These make excellent cut flowers. Clings by tendrils so may need some support as a climber, but is also useful as a ground cover over banks or slopes. Cut back in autumn, but will shoot again in the spring. This plant fixes nitrogen in the soil which will benefit surrounding plants. EVERLASTING SWEET PEA, RED PEARL (Lathyrus latifolius Red Pearl). Colourful, reliable, fast-growing, easy perennial, producing masses of large, pearly-red flowers over a long period. These make excellent cut flowers. Clings by tendrils so may need some support as a climber, but is also useful as a ground cover over banks or slopes. Cut back in autumn, but will shoot again in the spring. This plant fixes nitrogen in the soil which will benefit surrounding plants. EVERLASTING SWEET PEA, WHITE PEARL (Lathyrus latifolius White Pearl). Colourful, reliable, fast-growing, easy perennial, producing masses of large, pearly-white flowers over a long period. These make excellent cut flowers. Clings by tendrils so may need some support as a climber, but is also useful as a ground cover over banks or slopes. Cut back in autumn, but will shoot again in the spring. This plant fixes nitrogen in the soil which will benefit surrounding plants. GERANIUM, BLUE (Geranium Johnson's Blue) (Cranesbill). Good dense 'weed-proof' ground cover plant which retains some foliage all winter. Fast spreading but not invasive. Sunny or semi-shady position. A very free flowering variety with large clear blue flowers all summer. Height 12ins (30cm). Plant 15ins (38cm) apart. GERANIUM, CAMBRIDGE (Geranium cantabrigiense Cambridge) (Cranesbill). Good dense 'weed-proof' ground cover plant, fast spreading but not invasive. Sunny or semi-shady position. Evergreen variety with glossy, aromatic, light green foliage and a profusion of pinkish-mauve flowers in summer. Height 6-12ins (15-30cm). Plant 18ins (45cm) apart. GERANIUM, MAGENTA (Geranium sanguineum) (Cranesbill). Good dense 'weed-proof' ground cover plant which retains some foliage all winter. Fast spreading but not invasive. Sunny or semi-shady position. Deep green leaves make an excellent foil for the cup-shaped deep magenta-pink flowers. Height 6-9ins (15-23cm). Plant 18ins (45cm) apart. GERANIUM, PINK (Geranium macrorrhizum Ingwersen's Variety) (Cranesbill). Good dense 'weed-proof' ground cover plant which retains some foliage all winter. Fast spreading but not invasive. Sunny or semi-shady position. Very easily grown variety for any aspect. Aromatic leaves and large pale-pink flowers all summer. Height 18-24ins (45-60cm). Plant 18ins (45cm) apart. GERANIUM, ROSE-WHITE (Geranium cantabrigiense Biokovo) (Cranesbill). Good dense 'weed-proof' ground cover plant which retains some foliage all winter. Fast spreading but not invasive. Sunny or semi-shady position. More compact habit, but with long runners and attractive deeply divided roundish evergreen leaves up to 10cm (4ins) across so forms a good ground cover. Masses of white flowers tinged pink held well above the foliage. Height 6ins (15cm). Plant 18ins (45cm) apart. Superb, vigorous, spreading variety with neat, dense, lobed deciduous foliage which turns reddish-brown and firey orange in autumn. From early summer to late autumn it will be smothered with large, bowl shaped, violet blue flowers with white centres and deep purple rays radiating from the centre. Attractive to bees and butterflies. Excellent ground cover plant for full sun or partial shade. Height 12-18ins (30-45cm). Plant 18ins (45cm) apart. GERANIUM, WHITE (Geranium phaeum Album) (Cranesbill). Good dense 'weed-proof' ground cover plant which retains some foliage all winter. Fast spreading but not invasive. Sunny or semi-shady position. Very hardy clump forming variety with soft green leaves which are often marked with purple-brown. Produces large pure white nodding flowers from late spring and all summer. Height 2ft (60cm). Plant 18ins (45cm) apart. There is no doubt hellebores are remarkably easy to grow. They do prefer rich, moist, organically improved soil (so work generous amounts of home-made compost, Tree, Shrub & Rose Planting Compost or some well-rotted manure around the soil, and roots when planting as well as some friendly-fungi RootGrow), but they will also grow well in sandy or clay soils. Hellebores will even tolerate short periods of drought. Interestingly hellebores will grow in full shade under large deciduous trees as long as they receive sufficient sun from winter to spring before the tree comes back into leaf in the spring. All ivies listed in the Climbers section make excellent ground cover plants as they spread rapidly and only reach about 6ins / 15cm in height. For deep shade Irish Ivy is the best to use as, even if the conditions are dry, it will quickly make a dense mat of dark green foliage which will suppress weeds and make an attractive carpet. The other listed varieties, Goldheart and Sulphur Heart will add a splash of colour as well, but the colour will be brighter if in semi-shade or sun.